Gonadotrope cells of the anterior pituitary are essential in controlling reproductive competency of mammals through the release of gonadotropins, lutenizing hormone (LH) and follicle stimulating hormone (FSH). In secretory cells such as gonadotropes, the cytoplasmic face of the plasma membrane is associated with a dense meshwork of actin filaments (termed cortical actin) and actin binding proteins that play a role in both exocytosis and endocytosis. Upon activation, the actin network depolymerizes to allow for fusion of secretory vesicles with the plasma membrane for hormone release. Within the gonadotrope, LH and FSH are packaged into separate secretory granules that must be appropriately trafficked and regulated to achieve fusion with the plasma membrane and release of hormone into systemic circulation. In regards to gonadotropes, it has been shown that migration of secretory granules and release of LH requires an intact cytoskeleton although the precise mechanisms that regulate actin reorganization are unclear. Thus, my long-term research goal is to investigate the molecular mechanisms and function of GnRH communication to the cytoskeleton in gonadotrope cells of the anterior pituitary and how it relates to secretory events central to fertility. 4. Navratil AM, H Song, JB Hernandez, BD Cherrington, SJ Santos, JM Low, MH Do, MA Lawson. 2009. 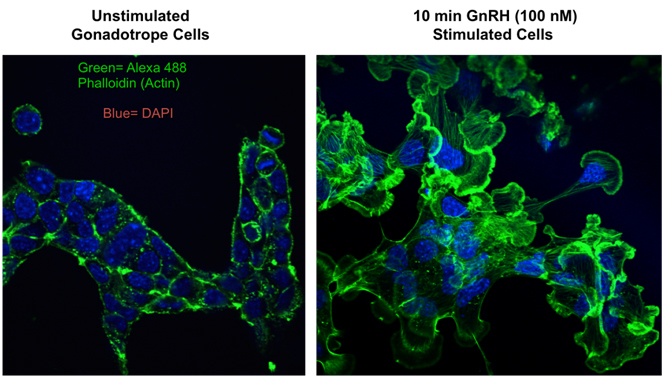 Insulin augments gonadotropin-releasing hormone induction of translation in LbetaT2 cells. Mol Cell Endocrinol. 2009 Nov 13;311(1-2):47-54. Epub 2009 Jul 24. 5. Bliss SP, A Miller, AM Navratil, J Xie, SP McDonough, PJ Fisher, GE Landreth, MS Roberson. 2009. ERK signaling in the pituitary is required for female but not male fertility. Mol Endocrinol. 2009 Jul;23(7):1092-101. Epub 2009 Apr 16. 9. Navratil AM, JG Knoll, SA Tobet, CM Clay. 2007. Neuroendocrine Plasticity in the Anterior Pituitary: GnRH Mediated Movement in vitro and in vivo. Endocrinology 2007 Apr;148(4):1736-44. Epub 2007 Jan 11. 10. Bliss SP, AM Navratil, M Breed, DC Skinner, CM Clay, MS Roberson. 2006. Signaling complexes associated with the type I GnRH receptor: Colocalization of ERK2 and GnRH receptor within lipid rafts. Mol. Endocrinol. 2007 Feb;21(2):538-49. Epub 2006 Oct 26. 11. Navratil AM, TA Farmerie, TM Nett, CM Clay. 2006. Differential Impact of Intracellular Carboxyl Terminal Domains on Lipid Raft Localization of the Murine Gonadotropin Releasing Hormone Receptor. Biol Reprod. May;74(5):788-97. Epub 2005 Dec 21. 13. Zong M, AM Navratil, CM Clay, BM Sanborn. 2004. Residues in the Hydrophilic Face of Putative Helix 8 of Oxytocin Receptor Are Important for Receptor Function. Biochemistry. Mar 30;43(12):3490-8. 14. Navratil AM, SP Bliss, KA Berghorn, JM Haughian, TA Farmerie, JK Graham, CM Clay, MS Roberson. 2003. Constitutive localization of the gonadotropin-releasing hormone (GnRH) receptor to low density membrane microdomains is necessary for GnRH signaling to ERK. J Biol Chem. Aug 22; 278(34):31 593-602. Epub 2003 Jun 5.